And my God- while it’s amazing that we won, I am fairly certain I won’t be able to walk for the next three days. I might need to work on my fitness levels. 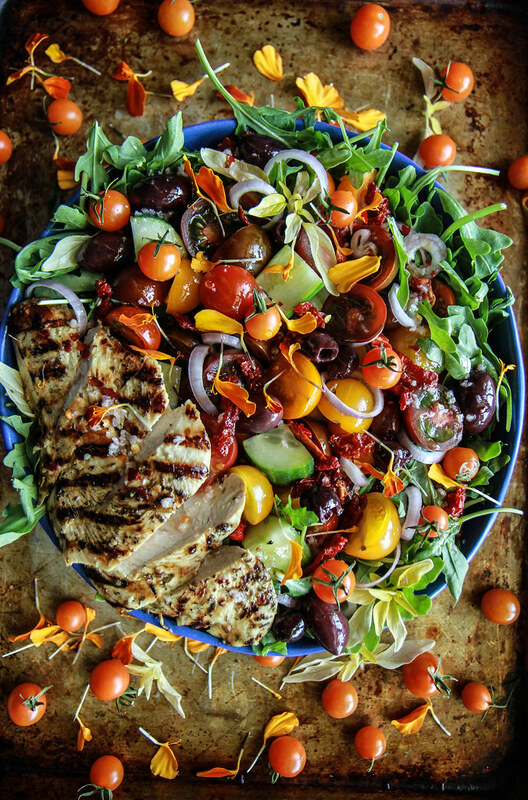 Anyways, I am going to quit babbling and share this Greek Grilled Chicken Salad with you today, as it was one of the few things I have been able to recently make in my kitchen and it was so fresh and delicious! 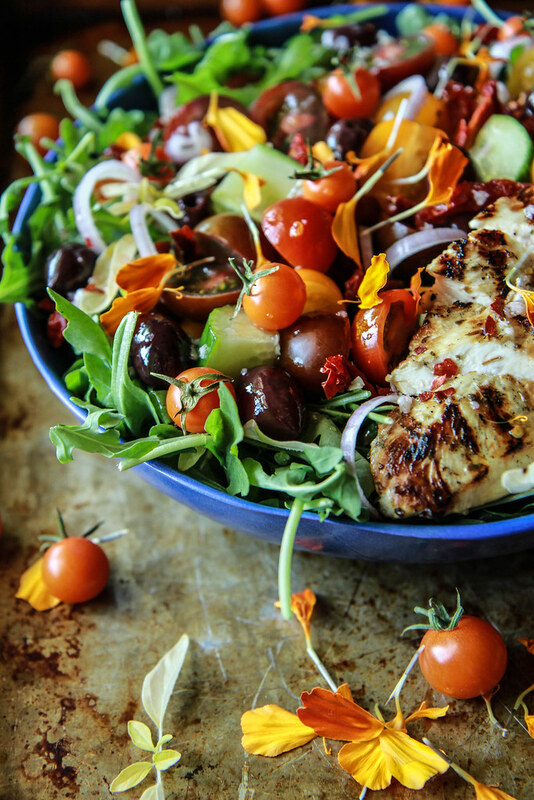 Packed with veggies, peppery greens and this lemon-garlic-oregano chicken- you are looking at a PERFECT summer dinner! Whisk together the marinade ingredients and add the chicken breasts. Let them marinate at least 15 minutes and up to an hour. Preheat the grill to medium and grill the chicken for about 3-4 minutes on each side until the chicken is just cooked through. Set aside to rest before slicing on the bias. While the chicken is resting, compose the salad. Make a bed of arugula and top with the vegetables and then top with the sliced chicken. Whisk together the vinaigrette and drizzle over the top of the salad. Serve Immediately! Yes, please share Instant Pot recipes. I love mine and am always looking for new things to make in it. Great to hear Deb!! thank you! I love my insta-pot and would appreciate any recipes you can share using it. Oh Awesome Kim! thanks for the feedback! This salad looks EPIC! Those grilling marks on the chicken are perfection! LOVE that this is whole30 compliant! Cannot wait to make this!! Thank you so much Lexi! Your salads are my favorite! Sounds like a fun weekend! I don’t think I’ve ever played a triple header before – I would probably be half dead by the end! Love this pretty, frilly salad! I was definitely half-dead!! lol! Thank you! You play softball? How did I not know this? And congrats on the game! I would need 2 of these after I played! Yum! Ha Yes!!!! I play on the Canlis restaurant team and it is SO fun! but three games in one day is INTENSE! 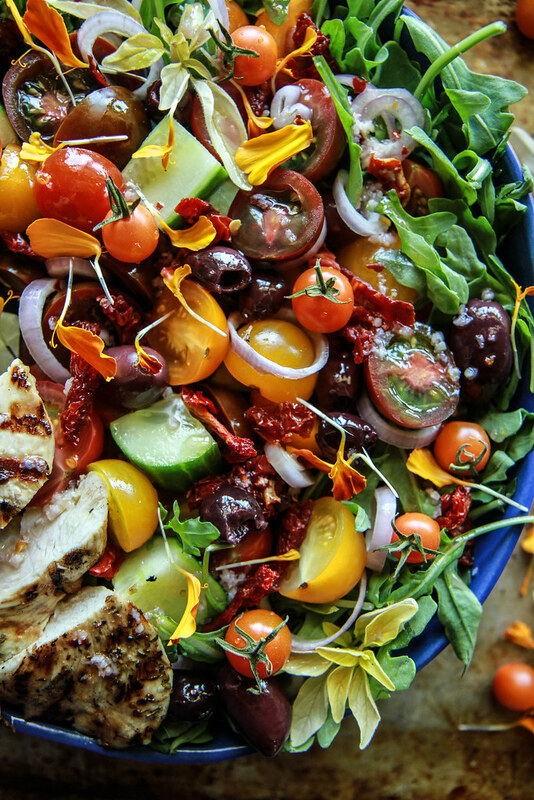 This salad is jam-packed with all the goodies! Beautiful salad – can’t wait to make. I bought a Fagor (similar to Instant Pot) about a year ago and still experimenting with it, so would love new recipes and ideas to take advantage of all of its features, especially pressure cooking. Thanks! Awesome Gail! I will definitely share some! Insta-Pot recipes would be very welcome. I pre-grilled some chicken breasts and would like to use them with this recipe. Would it be possible to create the marinade and heat up the chicken breasts in it?